Those who survived from tsunami about a decade ago know the pain of it. We just experienced how cruel and catastrophic it was from the little distance only. The seashore and nature that time appeared in the monstrous form of lord Shiva. Can the calm sea attack, coming into settlements like a wounded tiger? But it did. That time it was a kind of incident which has highly unlikely to happen. Sea and the land which embraces the sea was shaken unimaginably, the moment was rare and catastrophic. Even remembering it causes bristles to rise. Nature of mountain is different than the nature of sea. Even its sonorousness is unspeakable. Mountainous topography is generally smiling in its height. It is not merely static, it tolerates too. Tolerance is nature of earth. Generally earth is not furious. This also does not like us to do against her rule. Although she grows occasionally some poisonous tree, blossoms them and gives fruits, she loves more than that to grow corn, blossoms the flowers. Productivity and tolerance is common characteristics of earth. This time land of Nepal appeared before us with bringing great earthquake. This disastrous form of earthquake was equivalent to the disastrous form of earthquake of the year 1934 AD. This earthquake was very powerful and was similar to the powerful earthquake that hit Chile, Indonesia, Kobe and Haiti. It made the epicenter to Barpak, western part of Gorkha District of Nepal and was 7.9 Richter scale in magnitude and shook and affected Gorkha, Dhading, Nuwakot, Kavrepalanchok, Kathmandu valley and Rasuwa districts. Additionally it affected other 25 districts too. It brought avalanche in the base camp of Mt. Everest and the Langtang ranges. The shaking effect was experienced in northern India, Bhutan and Bangladesh as well. Friend from Delhi, Benares and Uttarpradesh immediately posted picture of shaking earth on facebook. The tremor which used to come once and vanish afterwards did not stop this time. The earth was shaking continuously. Shaking sprouted from the earth albeit, people thought it was all over for them. The houses were shaken like swings. 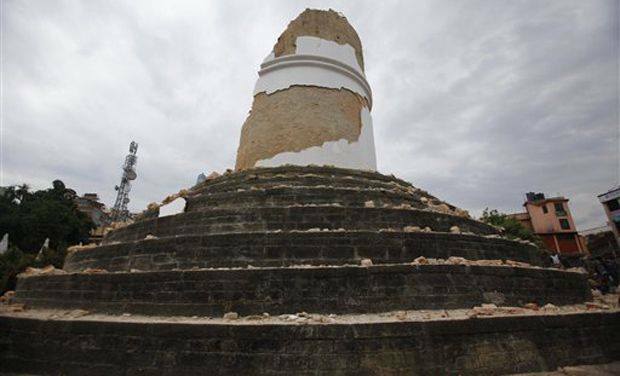 Dharhara tower of Kathmandu moved like needle of watch at 360 degree from its center. In next few seconds it turned to the heap of mud and bricks. Even after the powerful shock the land of Nepal continued to shake like a moving train on its track. Regular aftershocks were felt which did not stop at all. At times with long move and more speed. The land was shaking even after many days of this great earthquake. More than 200 tremors had been recorded. The number of aftershocks had risen even after many days of the great earthquake. The earthquake and aftershocks which hit Kathmandu valley destroyed invaluable archeological sites and national heritage like Dharahara tower(built in 1832) world heritage site Basantpur Durbar Square, Patan Durbar Square and Bhakapur Durbar Square. It showered with evil eyes at old structures in addition to the valuable jewels. A lot of old houses came to ruin. Not only the old houses, earthquake damaged new and large buildings and apartments. Buildings with poor foundation and those fallen on the wave of strike even strong building fell prey to the strike with either collapsed or tilted or developed cracks. Along with the physical property damage it also caused the loss of human life. 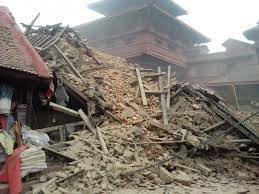 The people in the Dharahara Tower who were taking photos and the people who were coming out of the home, fell prey to the collapsed houses. In the area around Balaju the houses piled on one another. Houses kissed and flapped with each other. In absence of open area the people were compelled to trample under the buildings and got buried. This is the story of city. Many rural villages were swept away by the earthquake. Affected villages not only lost houses of human settlement it also damaged shelters of cattle and trampled animals too. In seconds, witnessing by their own eyes, the entire settlement turned into crematorium field. No one was spared to rescue and evacuate the trampled or buried, when entire village and settlement came under the complete grip of it. The one’s own house became the reason of one’s death. The earlier explained six districts came under the complete affect where about from 80 to 90 percent human and cattle settlement got demolished in the quake. No one knew the death that entered into the villages and cities when entire earth was shaking. 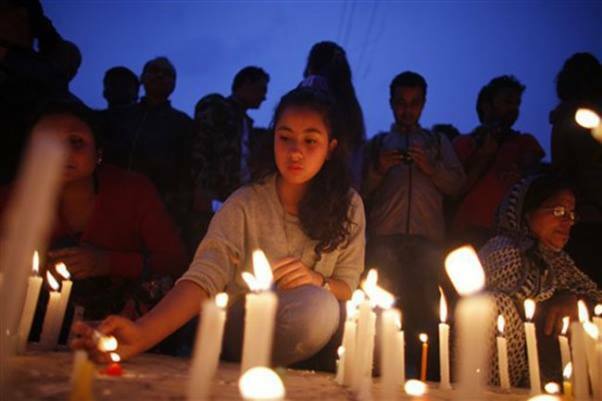 About ten thousand Nepalese are said to have lost their life in this earthquake while about twenty thousand sustained injuries and one million population came under the adverse impact of the earthquake. Economic loss is amounted to be few billion USD. The tremors are still felt. Falling of houses, uprooting of human settlement is also continuing. Many houses have developed multiple cracks and it has harmed the human settlements. Despite the loss of life and property, frequent shaking has frightened the survivors. As a result there is no environment to stay at home. Everyone was looking for open area. Alas! There were limited open areas available in Kathmandu. There were open area in villages and mountains but no provision of tent and foods. At the same time the weather too worsened. It rained and affected people under the grip of severe cold. People were forced to live hungry and without food, without roof and without water. The sorrow of loss of near and dear ones and the weather’s obstruction in rescue became another calamity. One cannot imagine as to how the people survived under such a severe hunger frightened by the earthquake. Remembering it alone brings fear. Even worse condition was with those who were trampled, buried and injured. The people were buried under the thousands of collapsed houses where as high as three hundred thousand houses were collapsed. Government alone did not have resources to rescue them all at once. In remote area the worry remained of transport. For big losses of cities, government got support from other countries and international communities. As the quantum of incident was so big, it was not possible to rescue those who were buried in time. There was a lack of proper help on the part of government too under such a crisis. We were weak in technical aspects as well. It was not possible for the government to rescue every collapsed house in absence of adequate infrastructure. Common people too were sitting under the tree and tent out of fear. There must be some three hundred thousand houses collapsed and additional four hundred thousand houses damaged, the loss worth of trillions of rupees. This load is unbearable for poor country and deprived economy. Why this land ? Nature turned so mad? sometimes makes sad and angry? Why it went to such monstrous form? Why demolished rural infrastructure? Why came heavily upon urban constructions? We are finding the fault of our own also in this. The shaking is continuous. We too are shakings from our core in this shaking. We have many questions shakings in our mind. We are asking our selves – whether we can learn some lessons from this earthquake? Can we turn this catastrophe into an opportunity? Can’t the furious earth be lured to lovely state? Couldn’t we get the love from her? Doesn’t her shakings fade away? Doesn’t her fury calm down? Can’t we keep her mum by remorse on our past mistakes and committing on well managed urbanization and construction going forward? So on and so forth. 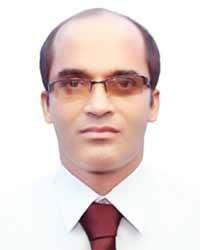 This earthquake is a big calamity for us Nepalese. This is a pinnacle of fury of a lovely discipline. A killing strike for human species. We don’t have any alternate example of this strike and do not know how to avoid the strike to the extent in future? We have to choose life of our own between life and death. We have to take trouble of trembles and stumbles for life. Poor army and police are deputed for rescue, taking their own life into danger. Where would they hide during continuous shakings? So called literate, stinking writers are dancing in the streets with un-tuned slogans attached on their chest. Their ill-mannered actions are accident prone. This became the reason for those sinful to come in the street. They don’t have to save the people they have to make a cry and just show their presence in the streets. Due to fear of continuous earthquake some thousands of people residing in the valley, have left the valley. Common people, business persons and professionals came forward for the support of victims. They reached to the victims with whatever they could collect like tents, food and clothes. Government did it with more vigour. Relief materials could be made available to the victims. In some instances there was lack of coordination among the kind hearted support providers. Nonetheless there came an ocean of sympathy for the victims. The world became one in the sorrow of Nepalese. All the grieved minds in the country too gathered in one place. In this hour of profound grief the Nepal became one which was divided for the reason of self-benefit from politics. All settlements were spilled with kindness. Although among sporadic numerous incidences desired rescue could not be made in time. Efforts were made to a great extent and rescue was done. Almost all the sectors were ready to offer their support. Many people provided sympathy and support to the earthquake victims. After-shock is still felt even after two weeks of great earthquake. It has frightened all Nepalese. How to uproot this fear? There is a deep wound in Nepalese society. Earthquake will strike again and will recede. How to reduce it’s psychological impact? How to replace the fearful psychology with positive and vigorous thoughts? We thank all the people who helped and acknowledge their supports and well wishes.